Kitchen Tour | Que Sera Sara? I love our apartment. I love it hard. Our apartment just clicked together so perfectly, and every single day it makes me happy. Never under-estimate your environment, people. Feng Shui or no, my home is my temple. I think I’ve had Home on the brain lately. Owing in part to our ongoing discussion about rent-vs.-buy for our next move, and in part to my cousin. She is a DIY maven and has started a lovely blog about her new home and mad decorating skills. I can boast no such talent — certainly not gorgeous DIY coffee tables — but I wanted to give you a little peek into our urban cottage for two. Our kitchen is huge for a city pad, but it has no counters and a staggering 3 cubbies of storage. Heaven help us. Goodness knows I wasn’t going to invest in heavy cabinetry and work tops for a fourth floor walk-up. I initially borrowed some heavy duty shelving from my mom’s basement as a temporary measure. 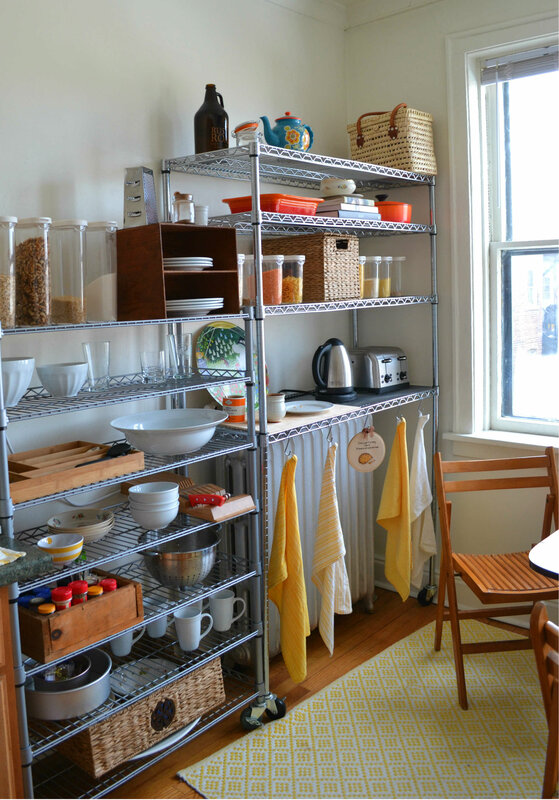 These metal adjustable shelves — like you’d find in a commercial kitchen — proved to be a godsend, though. They come apart for easy transport (and lugging up stairs), move-in day was hard enough. They are on casters for easy clean-up. The industrial style suits our flat beautifully. 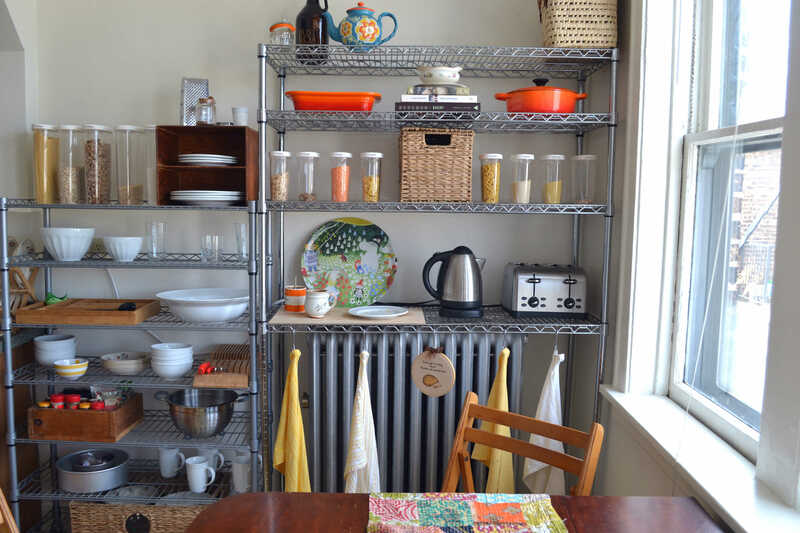 The open slatted shelving means I can put away still-damp dishes to save precious counter-space (and are the perfect deterrent for the occasional fluffy resident of our 100-year-old brick walls). They are perfect for our quirky flat. This flexibility meant we could install shelving up and over the antique radiator and maximize our space. And despite Bean’s questioning eyebrows I insisted on S-hooks to hang the tea towels in front of the radiator. This balances the colors (very important in my kitchen), and helps them dry quickly too. I’ve never been one for open shelving. They can look really cluttered and messy (which I imagine is why humans invented cabinet doors), and the stuff on them gets dusty (never a plus in a food service situation). I bought all white dishes instead of indulging my usual affinity for mismatched china. 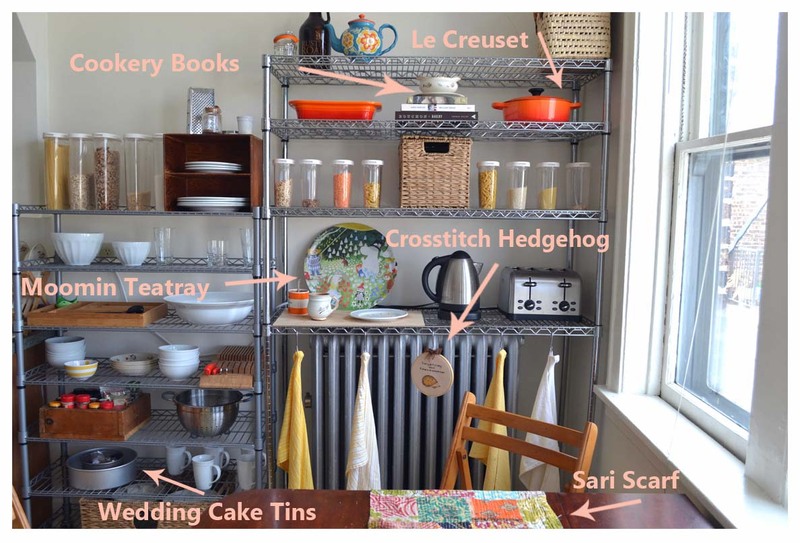 I showcased dry goods as a sort of free, tidy kitchen art. I stuck to chrome and seagrass and wood solutions for everyday items to keep the palate muted. And then I sprinkled bright, cheerful orange and yellow about in measured doses to give it some pep. Best of all, the open shelves give us capacity to display and cherish the few things we do have. Everywhere I look the room is full of the loving kindnesses of friends and family. A scarf my mom gave me, made up of scraps of sari fabric, serves as an exotic and colorful table runner. The tins which made our wedding cake gently remind us of that lovely gift from Bean’s infinitely talented baker sister. My much-coveted dutch oven was a wedding gift, too, from a friend far away, and most of the cookbooks were special deliveries from far-flung mates. My sister-in-law made Bean the embroidery hoop art for his birthday. It is a hedgehog with Pet Shop Boys lyrics stitched above. It’s perfectly silly and perfectly perfect. And our tea tray and mugs; the only things in this shot which came with us in the move across the world. They set the whole scheme in motion with their childish bright colors and sentimental charms. This pair of mugs has seen us through a great deal. Mine is fittingly literary, Bean’s a souvenir from a childhood visit to his mother’s native Dublin. And his mother bought us this Moomin tray on a day out together in Rye just before we left. She saw me eye it in a shop window and talk myself out of the splurge — Moomins have always been a special thing for Bean and I — and she popped back for it while we were up the village bell tower to surprise me with on our return. The new things we added have all the good feels, too. The dining table is a claw-footed antique mahogany beast, a replica of my great-grandmother’s. We picked it up from a Salvation Army for $20. A kitchen rug may seem extravagant, but my toes will tell you it’s a necessity in a Chicago winter, and its softness is much-appreciated by my eyeballs, too. The wooden boxes are from a barn sale in my dad’s sleepy hometown. My mom and I dug them out from underneath years of bolts and broken wagon wheels and I walked away with hardwood storage for $5. The fact that the box which now houses our spice rack (and used to house his tool bench supplies) says Lube etc. in scrawling crayon on one side just adds to its charm. I guess in the end, even though we did want to start over — new city, new country, new jobs, new lives — we didn’t want to start with a blank slate. To live in an IKEA showroom belies all that came before. I may have spent an inordinate amount of time gathering the odd boxes and matching the towels to the rug and still live within our budget, but I’m glad I did. Mixing the old and the new, the rough and the shiny, is what makes life rich and textured. I’m glad our house has some character and some oddly sentimental quirks. Yes, it’s a little student-y with borrowed shelves and no bread knife. But it has charm and love, and in spades. And that makes it feel like home.